Spices, vegetables contained in your kitchen’s cupboard are important and if you become familiar with their medicinal properties you can become a doctor in the house. Onion is an integral part of the kitchen. It is used in all recipes, food and salad. Let us know what are the traditional recipes of onions and you can become healthy by adopting it. The tips of tribal mentioned here are somewhere has proven by modern science. The kitchen is incomplete without the onions. Onion is a very healthy plant. Onion has glutamine, arginine, sistan, and seponin important chemicals. It has sugar too. Grind the seeds of onion in vinegar and apply it on herpes-itch. You will get immediate relief. In tribal areas people keep chicken pox patient wearing onion as the believe it prevents microbial effects and transitions. Mixed juice of onion in mustard oil and apply it on joint pains. You will get relief in rheumatism, arthritis. It is believed that if you try this for two consecutive months it will give you many benefits. Elders and children can take onion juice mixed with sugar when they have over cough problem. Mixture of onion juice and salt reduces inflammation and tooth pain. Onions are white and red. White onion is good for the heart and red onion is corroborant. In summer, you can apply white bread of onion with sandal on forehead. You will get relief. Take honey with white onion juice to increase the sperm. Tribal of Patalkot apply onion juice on bite of honey-bee or wasp. Diabetes Control: Daily consumption of onion produces right amount of insulin. If you have diabetes then you must have to include in your diet as salad. For stone: If you suffer from kidney stone then onion is very useful for you. Drink onion juice mixed with sugar and you will get rid of kidney stone. Drink onion juice in the morning and stone slip goes out automatically. To overcome constipation: Fiber in the onions is extremely beneficial to the stomach. Constipation removes by eating onions. If you have constipation then you must have to eat onion every day. 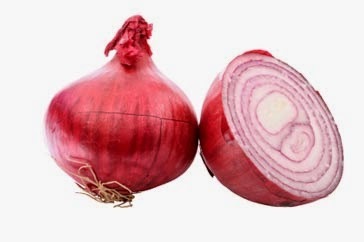 Fight with colds: Intake of onion is beneficial in winter. There are elements that give body heat. Onion juice is very beneficial in cold, cough and sore throat. You can take with jaggery or honey.